In 2020, we're cruising to Africa! More than ten different African nations are on our itineraries, including Kenya, South Africa, and Namibia. We can't wait to explore the beautiful and fascinating coastlines of the African continent. In honor of adding these new destinations to our ports-of-call, we called up a few Azamara crew members who were born in Africa to ask them about their homelands. You can read our Q&A with Philip, from Kenya, here. And, you can read our Q&A with Almé, from South Africa, here. In this interview, we're chatting with Liesl Bubner, from Namibia. Hi Liesl, thanks for joining us today! You're from Namibia, a country we can't wait to visit in 2020. Where in Namibia did you grow up? I grew up on a farm in the central of Namibia, Okahandja. I lived there all my life and then finished high school in Windhoek, the capital of Namibia. I then went to Cape Town for university and once I graduated I came to the ships. I studied Sports Management. At the time I had no idea cruise ships even existed because we didn't have any cruise ships coming to Namibia. I was just a young student who saw an ad in the newspaper and that’s how I ended up working on a ship. What did you love most about growing up in Namibia? In 2020, Azamara is sailing to several maiden ports in Africa, including two in Namibia: Luderitz, and Walvis Bay. What do you think guests will enjoy most about visiting Namibia? I think the highlight for our guests will really be going into the desert and experiencing what it’s all about. And also close to Walvis Bay is a town called Swakopmund, on the coast and I think it’s a must-see. Walvis Bay is really a port city, and Swakopmund is a beautiful destination city. What do you think will surprise guests the most about Namibia? How well developed the country is. I know people always perceive Africa with poverty, but Namibia is very well developed. It’s very clean and it’s also nice to see how many different ethnics groups can live in such harmony - there are 13 different ethnics groups that live in Namibia. How would you describe the people in Namibia? Very friendly, very open, we love welcoming foreigners. Guests will have a warm welcome. Azamara’s focus is on Destination Immersion and Exploring Further, as a local, what tips would you give guests for the most cultural immersive experience? They actually offer something called ‘Town Ship Tours’, in all the ports we’re offering, and what they do is take the people on a walking tour, go to some houses, meet the local families and try some of the local snacks. Namibia is maybe most famous as home to the world’s oldest desert. 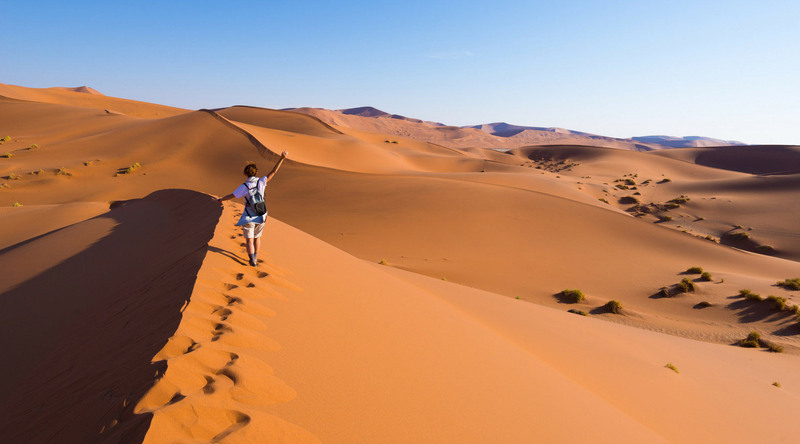 What makes the Namib Desert a bucket list destination? There are basically two areas, one has very, very high sand dunes, famous for some of the highest sand dunes in the world, and then when you go behind the dunes, you have what we call the moon landscape; and typically people come and visit both the sand dunes and the moon landscape. During the day it’s going in by 4x4 or even walk in it, however, it gets very hot and the sand gets very soft. The area overall is very beautiful and the colors are so dramatic - so people who like photography would love visiting this area. It’s also famous for the Welwitschia, which is one of the oldest plants in the world. Namibia is also known as a leader in wildlife conservation, and guests can expect to see many different kinds of animals when they visit. What’s your favorite animal that’s native to Namibia? I love giraffes, but where the ship is we will not be able to see wildlife. It’s surrounded by desert and there are only a few creatures such as the “little five” or water animals like seals, dolphins and beautiful flamingos. For many guests, cruising to Africa will be a once-in-a-lifetime adventure. They’ll want a memento of the occasion! What souvenirs do you recommend they pick up? Locals are very crafty. You’ll find your typical wood carvings of animals, bowls or wall art, but they also make items with soapstone. It would be nice to pick-up an item made out of that as well as wood. It originally comes from Zambia and Zimbabwe and has now made its way to Namibia. We’re sailing to several ports along the Atlantic coast of Africa in 2020. Besides Namibia, guests can visit ports in Angola, Ghana, Ivory Coast, and Gambia. If you were booking a cruise, which of these destinations would you most look forward to? Why? To be honest, I haven’t been to any of them, so I’m excited to see them all. I know all of those countries are very diverse so I’m really excited to experience them all. I’ve been to the southern countries, like Namibia, Zimbabwe, South Africa and Botswana. What does it mean to you to be going back home with your Azamara family? I am super excited. It's very special. I joined Azamara in 2007 for the first time, so I’ve met many guests along the way. It would be nice to show my country and my hometown, Swakopmund, to these guests, and it will be great to show my family where I actually work. Learn more about our cruises to Namibia, and all our African voyages.